Pampered Margaret Macy flees London in disguise to escape pressure to marry a dishonourable man. With no money and nowhere else to go, she takes a position as a housemaid in the home of Nathaniel Upchurch, a suitor she once rejected in hopes of winning his dashing brother. Praying no one will recognize her, Margaret fumbles through the first real work of her life. If she can last until her next birthday, she will gain an inheritance from a spinster aunt - and sweet independence. But can she remain hidden as a servant even when prying eyes visit Fairbourne Hall? Observing both brothers as an "invisible" servant, Margaret learns she may have misjudged Nathaniel. Is it too late to rekindle his admiration? And when one of the family is nearly killed, Margaret alone discovers who was responsible. Should she come forward, even at the risk of her reputation and perhaps her life? And can she avoid an obvious trap meant to force her from hiding? On her journey from wellborn lady to servant to uncertain future, Margaret must learn to look past appearances and find the true meaning of "serve one another in love". 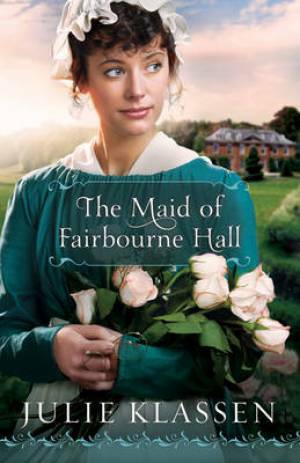 The Maid of Fairbourne Hall by Julie Klassen was published by Baker in February 2012 and is our 16830th best seller. The ISBN for The Maid of Fairbourne Hall is 9780764207099. Christy winner Klassen (The Girl in the Gatehouse) mines another gem of a story from the rich Regency vein. Margaret Macy, who is soon to inherit a fortune that will allow her to be independent, flees the home of her stepfather rather than be forced to marry his odious fortune-hunting nephew. Margaret literally becomes the poor little rich girl as she is forced to take a job as a housemaid, disguising herself as Nora Garret to work in the home of Nathaniel Upchurch, whose marriage proposal she had rejected, hoping to snare his dashing older brother Lewis instead. In a tale of disguise and transformation with echoes of The Prince and the Pauper and perhaps a dash of Shakespearean heroine, Margaret?s character and judgment are enriched as she works for a living?and it wouldn?t be a Regency romance without a suitable suitor for her. The upstairs-downstairs dynamic of the upper and serving classes puts meat on the story?s bones. The reliable Klassen has produced a well-realized genre winner in which Christian elements are subtle and historically appropriate. Margaret Macy really has no choice. Margaret?s new stepfather, Sterling Benton, is plotting to gain control of the money Margaret will inherit from her recently deceased aunt by marrying Margaret off to his nephew Benton. With no one to turn to for help, Margaret runs away from her home in London. What little money Margaret brings with her is quickly exhausted, forcing her to accept a job as a maid at Fairbourne Hall. All Margaret has to do is quietly remain in hiding there as ?Nora Garret? until she comes into her inheritance. But her new employer is none other than Nathaniel Upchurch, whose offer of marriage Margaret rejected years ago. Christy Award winner and RITA nominee Klassen delivers another impeccably crafted romance rich in fascinating details about life both upstairs and downstairs in a country estate. An excellent choice for fans of faith-based fiction and readers who miss traditional Regency romances. Oh how I needed that! A light read with a story that kept you reading and wondering how things were going to turn out. No time to think about other things. Margaret Macy is soon to inherit her Great Aunt’s money. Her ‘wicked’ stepfather has designs on it, and an evil plan to get it. She runs away and becomes a maid in the house of her rejected suitor. All pretty predictable but with some surprising twists and turns. Julie Klassen has set other books in England, and I have enjoyed them too but sometimes have hesitated over some hint of Americanism. Not so here. Her research into background information has enabled her to write a very believable and heart-warming story. Oh how I needed that! A light read with a story that kept you reading and wondering how things were going to turn out. No time to think about other things. Margaret Macy is soon to inherit her Great Aunt?s money. Her ?wicked? stepfather has designs on it, and an evil plan to get it. She runs away and becomes a maid in the house of her rejected suitor. All pretty predictable but with some surprising twists and turns. Julie Klassen has set other books in England, and I have enjoyed them too but sometimes have hesitated over some hint of Americanism. Not so here. Her research into background information has enabled her to write a very believable and heart-warming story. Got a question? No problem! Just click here to ask us about The Maid of Fairbourne Hall.